Desh is an experienced media industry professional having close to 18 years of valued expertise in Singapore. 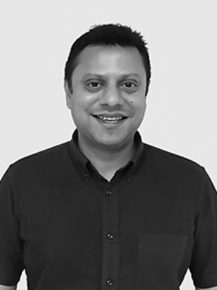 He was the Managing Director of Maxus Singapore, a GroupM agency in 2014 and then the merged Maxus & MEC entity – Wavemaker Singapore from 1 Jul 2017. He was also the Executive Director at Havas Media Singapore from 2008 – 2014 and had stints with Mindshare, Chuo Senko Advertising and AGI Communications in the local media scene. Desh’s areas of expertise covers strategic media counsel with end to end 360 solutions on all media planning. His digital expertise covers all digital platforms including SEM/ Display/Video/Social/Content/Programmatic as well as technology domain knowledge on DMPs/DSPs/Exchanges/Automation. He was also instrumental in implementing DMPs for Jetstar in APAC & OCBC in SG. He’s overseen and managed key global, regional & local clients who include both private sector & government organisations. These brands include DBS, POSB, OCBC, Temasek, Jetstar, Frasers Centrepoint Malls & Properties, Allianz Global, Aberdeen Zsset Management, HBO, Alibaba, Bank of China, Daimler, Manulife, AXA, Tafep, MND, MOE, HPB, CPF, MCI & MCCY.